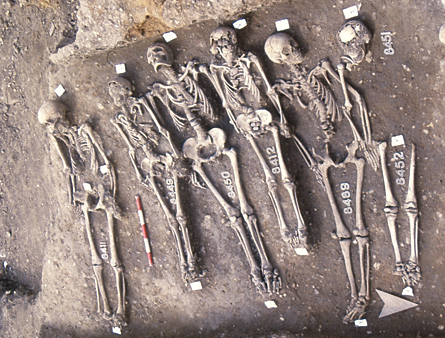 Using methods that seem inspired by Frankenstein and Jurassic Park, scientists have reconstructed the entire DNA sequence of the ancient microbe responsible for the Black Death, the plague that killed half of Europe’s population between 1347 and 1351. 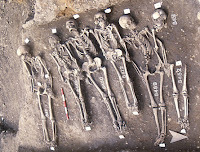 Using bits of the bacterium Yersinia pestis plucked from the teeth of four well-preserved skeletons of plague victims excavated from London’s East Smithfield cemetery in the 1980s, an international team of researchers found that the medieval microbe has nearly the same genetic code as modern strains of the bacterium. The scientists found no evidence that genetic mutations helped the 14th century strain of Y. pestis notch such a massive death toll. “As to why this killed so many people across Europe in 1348, there is no particular smoking gun,” says geneticist Hendrik Poinar of McMaster University in Ontario, Canada, a member of the international team of anthropologists and evolutionary geneticists who published their findings online October 12 in Nature.